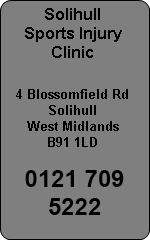 Solihull Sports Injury Clinic for Sports Injuries West Midlands. 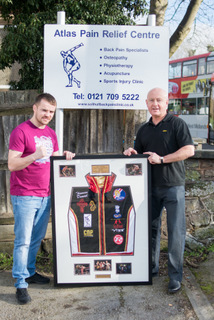 Located in the West Midlands near Solihull town centre South Birmingham, the Atlas Sports Injury Clinic Solihull caters for all sports injury needs. Staffed by experienced Sports Physiotherapists, a Sports Podiatrist, Osteopaths and Sports Therapists at the Solihull clinic, the friendly staff will get you back to fitness as quickly as possible. We also have sports injury clinics in Tamworth and Atherstone. Are you a runner? We have a specialist Solihull Running Injury Clinic to cater for all levels of runner, ultra runner, marathon runner and triathlete. Biomechanical evaluations, laser foot scanning, video gait analysis and prescription orthotics as well as training advice are always available. Sports injury treatment is our speciality and should it be a runner or triathlete, golfer with back pain, a skier with a knee injury, an athlete, footballer, dancer or rider, we can help get you back to sport quickly and effectively. Atlas have a "fast recovery reputation" and have won customer service awards for two consecutive years. Most of our business is from personal recommendation which illustrates how effective we are. Dancing and gymnastic injuries for children and adults can prevent them from training and competing. Atlas has the expertise to help youngsters get back to full fitness in the quickest possible time and offer injury prevention advice. Sports Massage and Deep Tissue Massage is available from experienced sports massage therapists which can assist with hard training regimes and injury prevention. Massage helps recovery after hard training sessions and relaxes tired aching muscles. Our massage therapist has toured the Far East for 5 years with the Lord of The Dance show providing massage to Michael Flatley and his team. Stretching is vital in injury prevention and stretching advice can be found on our stretching advice page.